DUKE BRIDGE / PAVILION - Projects - James Carpenter Design Associates Inc. The Bridge / Pavilion embeds a sense of Duke’s forested grounds within each student’s experience of their built environment. 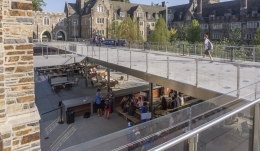 Duke West Campus Bridge/Pavilion from James Carpenter Design Assoc. on Vimeo. AS STUDENTS CROSS THE BRIDGE, THEIR IMAGE AND SHADOW ACTIVATES THE GLASS PRISMS EMBEDDED WITHIN THE DECK. The Bridge / Pavilion merges the function of a bridge above and canopy below. Founded on the idea of walking through a forested landscape, this concept defines the main student-life circulation axis through the West Union District. The bridge is a thin and lightweight concrete structure featuring a coffered ceiling that both removes mass and adds structural efficiency. At the center of each coffer is a void occupied by a prismatic glass. From below,each concave form is illuminated by the prismatic glass which is designed to also project light within the bridge deck’s cast shadow. Strategic vertical planes of etched glass help define the sense of outdoor rooms below the bridge, moderating outdoor conditions and abstracting light and color from the adjacent landscape, capturing student circulation activity and revealing it within its materiality.